Visit littleliteracylibrarian for reviews of apps you can use with your young child! 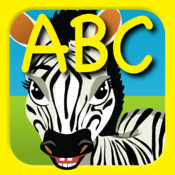 Z is for Zebra helps children learn their ABCs through play with upper and lower case letters, graphics and sounds. Tap a letter and hear its sounds. Tap the animal and hear the name of the animal. Select the matching game and help your child draw a line from the letter to the animal or graphic. Letters are the building blocks of words. Helping your child learn their letters and their sounds through play will prepare them to arrive at school ready to learn to read. Don’t forget to sing the ABC song. Pick a letter beforehand in the app – tap it (encourage your child to tap also) and let your child hear how it sounds. Then when signing the ABC song, ask your child to jump (or do something silly) when they hear the letter. This app allows you to record a voice for the letters – so feel free to personalize! All of the apps reviewed in Appy Monday! are available on the iPads located in the Picture Book Room here at the Vernon Area Public Library!